H4Y Technologies LLC Review 2019: Is H4Y Technologies LLC a Good Hosting? Formerly known as Host for Yourself LLC, H4Y Technologies LLC has been a trusted hosting partner for many customers since its inception in 2001. The company is based in Brookeville, Maryland in the United States. It offers an array of hosting solutions including shared hosting, VPS, dedicated hosting, and colocation services for businesses across the U.S.
H4Y Technologies LLC is a limited liability partnership hosting company, formerly known as Host for Yourself LLC. The vendor was established in 2001, and its offices are located in Brookeville, Maryland in the United States. With over 15 years of experience in the hosting space, this hosting firm is a tried and tested name in the U.S. hosting market offering high-end hosting solutions to its customers. Among other solutions, it offers shared hosting, VPS, dedicated servers, SSL certificates, managed and unmanaged cloud servers, and colocation services. H4Y makes use of the power and resources of five data center facilities distributed across the United States. The vendor’s servers are top-notch and modern, and are regularly upgraded to keep up with the latest updates and specs. All of the hardware facilities are enterprise-grade and are powered by industry-leading companies HP, Dell, and Supermicro. H4Y Technologies hosting packages are designed for businesses of all sizes: from small businesses and startups to large corporations with lots of traffic. The packages offer generous storage, unmetered transfer, plenty of bandwidth, and other advanced features. 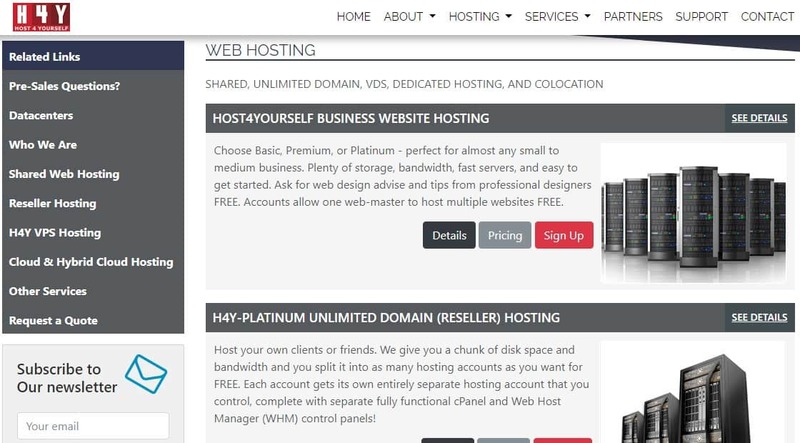 H4Y Technologies’ three shared hosting options are Basic, Premium, and Platinum. Reseller accounts use the popular cPanel/WHM control panels. In addition, H4Y performs free offsite server backups powered by multiple SSD drives with RAID-10 technology. H4Y Technologies customers that need advanced security for their e-commerce or other websites with sensitive data need not outsource SSL certificates. This vendor offers a wide range of SSL certificates to choose from including AlphaSSL, AlphaSSL, and Wildcard True BusinessID EV. H4Y Technologies hosting plans might seem expensive at first glance, but a closer look reveals that they are pretty reasonably priced, considering the many features included. All of the plans include 30-day money-back and price-freeze guarantees. That said, it’s important to keep in mind that the refund policy only applies to yearly contracts. H4Y has a 100% server uptime guarantee that is backed by a compensation plan in case customers experiences network downtimes. 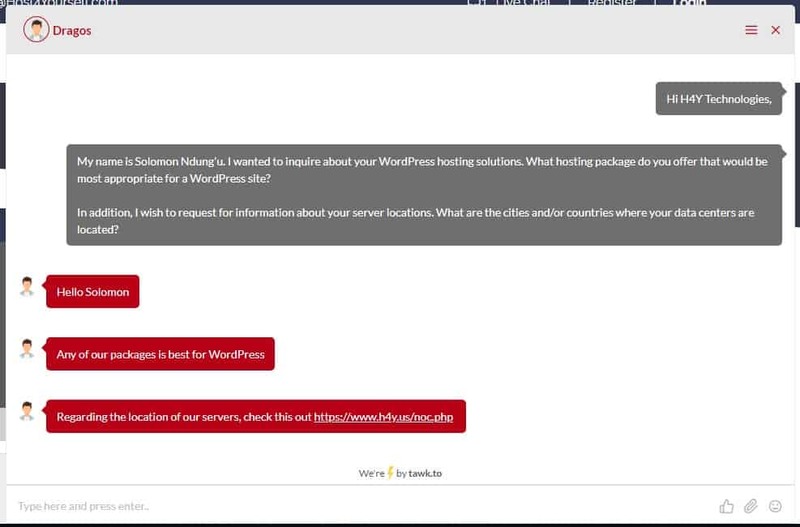 If you run into hosting-related issues, you can contact the H4Y Technologies support team via telephone, email, live chat, ticketing system, or through the contact forms displayed on the website. The support desk is available 24/7 with an experienced team of professionals to help you solve your hosting problems. I started a conversation with one of this vendor’s support reps via its website live chat, and got fast and clear responses to my queries. The vendor has also put up a fairly detailed knowledge base with tutorials and articles to further help its customers. From simple to advanced and enterprise-grade solutions, H4Y Technologies offers feature-packed hosting services to businesses of all sizes. With five data center facilities, over 15 years of experience, and a knowledgeable and highly responsive support team, the company has everything necessary to deliver quality hosting solutions to businesses in any part of the world. Wondering how H4Y Technologies LLC stacks up against other Web Hosting companies? Enter any other Web Hosting company and we will give you a side-by-side comparison.